← French food, light mystery – what’s not to like? 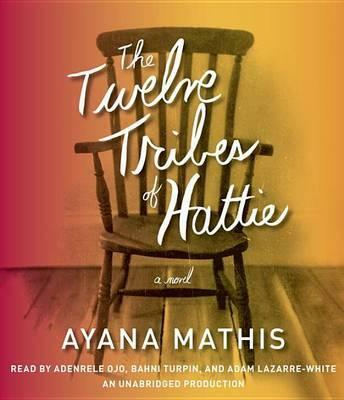 For a debut novelist, it doesn’t get much better than what is unfolding for Ayana Mathis and The Twelve Tribes of Hattie. It’s Oprah’s pick for her book club, and it was featured on the cover of The New York Times Book Review on Jan. 6. The book deserves the attention. It is a haunting, beautifully written book, though one whose stories are often painful. THE TWELVE TRIBES OF HATTIE. By Ayana Mathis. Random House Audio. Read by Adenrele Ojo, Bahni Turpin and Adam Lazarre-White. 8 CDs, 10 ½ hours. $40. Also available in print from Knopf. This poetic, deeply affecting book is a story set in, but not the story of, the Great Migration, that time from World War I to 1970 when 6 million black Americans left the South in hopes of better lives in the North or West. That historic migration, which eventually gave rise to the civil rights movement and did much to shape the United States we know today, has inspired other fiction by black Americans, and it was chronicled brilliantly in The Warmth of Other Suns: The Epic Story of America’s Great Migration, a much-honored nonfiction book by Isabel Wilkerson, a New York Times journalist. 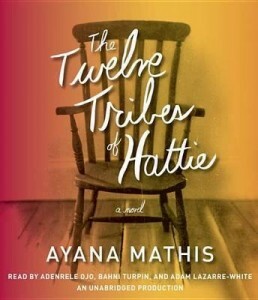 In her review of Mathis’ novel for the Times, Wilkerson rightly says that The Twelve Tribes of Hattie is not The Grapes of Wrath of the Great Migration. Writing such an epic story was clearly not Mathis’ intent. Instead, she grounded a story of one woman’s family in an era and a circumstance that affected many such families. Mathis tells one family’s story not as a way to chronicle a broader movement, but as a way to examine one woman’s wounded heart and soul, and how her emotional scars affect her offspring. This is a deeply personal story. Young Hattie fled Georgia with her family after her father was killed, the victim of racism. She married August Shepherd, and as the book opens in 1925, she is a 17-year-old mother in Philadelphia helplessly watching her twins die of pneumonia. Though she bears nine more children, Hattie never emotionally recovers from the needless loss of her first babies. She always mourns them and the lives they might have had. With a great ferocity, she does what’s necessary to keep her later children alive, but her mothering is all about survival, with no room for love or tenderness. August is always a disappointment, rarely holding a steady job, wasting what money he earns on women and good times at the juke joints. Hattie scrapes and works to keep her children fed, clothed and as safe from harm as possible. She doesn’t spend time hugging and kissing, not only because she’s too exhausted, but also because she wants them to learn what she considers a vital life lesson: The world doesn’t love you, and it won’t be kind to you. Life is hard, and full of troubles. If anything, the children take that lesson too much to heart. Certainly, Hattie’s predictions prove all too true. The book progresses in chapters that tell of the various children, and one grandchild, one or two at the time, at different stages in their lives and at different points over six decades. The “twelve tribes” is a reference to the Bible’s 12 tribes of Israel, direct descendants of Jacob. The 12 tribes of Hattie might be her 11 children, including the twins who died as infants, and the one granddaughter she is helping to raise at the end of the book, still devoting herself to her offspring in her old age. These snapshots of the children’s lives, in some cases followed up by mentions in later chapters, show that every one of them was marked by the way their mother, “the General,” seemed so harsh, so unloving. Even the story of the last baby, the one Hattie is persuaded to give away to her well-to-do and childless sister back in Georgia, is devastating. That little girl may well have grown up to have a happy life, but the reader doesn’t know what becomes of her. Instead, we are haunted by what happened to the sister and her husband when they stopped at a roadside rest area in segregated Virginia, and by Hattie’s anguish at having to let the baby go. At times, the travails of Hattie and her children are almost overwhelming. Their lives are full of disasters, mental and emotional illness, betrayal, deception, abuse, poverty. One is severely burned. One nearly dies of tuberculosis, looking at her prospective death as a release. Even one who marries into wealth in an attempt to escape the family fate is damaged and miserable. The reader begins to wonder if Mathis is piling on too much. Did no one in this family have, if not a happy life, at least an average life of “normal” ups and downs? Yet the book is not nearly as grim as it sounds, and well worth the reading. There is some redemption for Hattie as the years wear on, a few opportunities to try again with her offspring. And the writing is beautifully poetic. Words and images are wonderfully crafted, sparkling and spare, working together to weave stories that won’t soon be forgotten. Listening to the audio version of the book was, for the most part, rewarding. There were times when the stories were so painful that I might have stopped reading had I been dealing with a printed book, yet the beauty of the prose, expertly read, kept me going. The one drawback to listening without a printed copy came in the way the intertwined stories moved over time; I sometimes wanted to refresh my memory about what had happened when. This entry was posted in American History, Audio Books, Contemporary literary fiction, Historical Fiction and tagged African-American fiction, Ayana Mathis, Great Migration, Oprah, The Twelve Tribes of Hattie. Bookmark the permalink.